Emancipatory approaches to nursing research and practice have escalated in the context of major political and cultural upheavals worldwide. 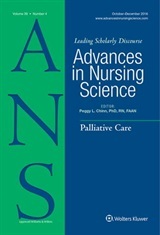 For this issue we seek scholarship that informs emancipatory nursing practice and research. We welcome research reports that use emancipatory methodologies, emancipatory philosophic analyses, critical and feminist critiques of existing discourses and practices, description of and evidence supporting emancipatory nursing practices. Date manuscripts are due: April 15, 2018.